Old villas in prime locations provide interesting investment opportunities for the careful buyer, and some of the best investments are to be found in and around Carvoeiro. Anyone searching for a villa on the Algarve is faced with an array of options. Estate agents’ books are literally bursting at the seams with properties for all tastes and most pockets. Recent years, however, have seen a shift away from older resale villas to modern hassle-free properties with all mod cons. Throughout the length and breadth of the coast, this trend has resulted in an excess of older properties lingering in agents’ windows with the knock-on effect of stagnation and heavy reduction of prices in some areas. New build properties on the other hand have generally held their value better creating a buyers market for those willing to take on an older villa that, if renovated and bought up to modern standards, can appreciate considerably in value. As well as potential investment growth, here are some key benefits to choosing an older property. Normally built on larger plots in prime locations, the gardens and surrounding landscape will have matured and – unless there is a new development planned alongside – you know that you will not be living on a building site for the next four or five years. On the other hand the major concerns are with the often-poor standards of construction of villas built in the ‘70s and ‘80s, not to mention plumbing and wiring that may need to be completely renewed. The quirky aesthetics that appear characteristic at first sight – ageing wooden window frames, for instance – will very quickly become a hindrance, and will most probably have to be replaced. Other considerations include whether the property has the correct paperwork. With a new property you know what you are getting. If you buy a plot, you can design your own dream home: on a development you can often personalize the interior. The materials used and the construction methods will be superior: double glazing, air conditioning and under floor heating are standard in most new properties. On the other hand, the plot will probably be relatively small and the villa perhaps closer to its neighbour than desired, so noise and privacy could become issues. All along the Algarve coastline, the prime construction plots offering the best locations and views were snapped up long ago. A typical example is Praia do Carvoeiro, one of the Algarve’s first second home hotspots where the first villas were built back in the ‘60s and the market already well developed by the early ‘70s. Over the years, the stretch of coastline to the east and west of town has changed little with the vast majority of development being individual villas or small villa developments that were mostly completed by the early ‘80s. 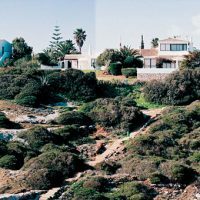 Many of these old villas can be found on the books of Carvoeiro’s estate agents today and the prices usually compare favourably with new properties of a similar size with many ripe for renovation. The buyer may have to invest in improvements such as a new kitchen, bathrooms and double-glazing, not to mention possible technical repairs. But once brought up to modern standards the value placed on the property’s location will ensure that any money is well spent, the key factor being that the property is acquired for the right price allowing a sufficient budget for improvements.